Thank you for visiting my 'Bunch of Wishes' website. 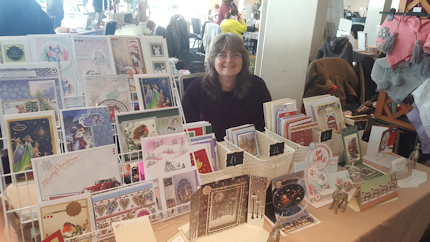 My name is Yvonne and I have a passion for making handcrafted cards. Click on an image above for larger design. I have had fun attending my first craft fair this year. The photo below is of me on my stall at the Cliffs Pavilion in Southend. I enjoyed myself so much, I am already looking at planning more next year. I'll keep you posted, so keep checking back.